Having the best tools is important if you want to bake beautiful bread of pastries. We have compiled a list of excellent tools that are useful for both master bakers and home baking beginners. Alfi Bread Scorer: The patented ALFI® Bread Scorer is an outstanding baker’s tool that effortlessly and consistently ensures the proper rising of dough in the oven. Unlike its predecessor (an inconsistent and relatively pricey tool called a “lame”), the Alfi bread scorer requires minimal training, guesswork or learning-curve, and eliminates costly, time-consuming errors. The Alfi bread scorer is NSF approved and used in artisan bakeries and large bakery chains all over the world for optimal baking efficiency. It is the most effective, economical and effortless scoring solution for baking. The Scorer is ergonomically designed with a drag-free blade that minimizes dragging or pulling. If you want to get the perfect score every time, the Alfi bread scorer is the tool for you. Demarle Silpat® Non-Stick Baking Mat (Half-Size): Stop burning the bottom of your bread and cookies – try a Demarle Silpat® baking mat. This incredible, non-stick baking-mat can be found in the best kitchens in the world. The mat is used by both bakers and chefs alike. The durable Silpat® baking mat can be reused thousands of times. Use this baking mat and make the best cookies ever. Long Lasting Pastry Bag by MartellatoA pastry bag is one of the most versatile tools known to bakers. This high quality pastry bag is a must-have for every serious home baker. Martellato’s innovative, reusable, and resistant pastry bag gives this product outstanding flexibility and softness that is second to none. This superflex pastry bag has a smooth internal surface that results in easy emission of creams, mousse, or even culinary uses (such as creamy whipped potatoes). Martellato also offers an external rough surface that allows the baker to get a better grip on the bag. This product is high quality and guarantees the highest hygienic safety. Try out Martellato long-lasting pastry bags today and see why everyone is raving about them! Demarle Siltray® (Baguette Tray): These flexible Baguette Trays are especially effective for proofing and baking frozen dough. Their particular structure prevents the dough from sticking into the fibers during defrosting and proofing. 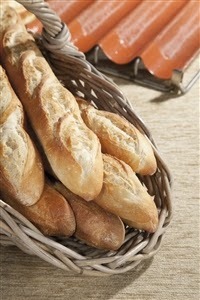 Their flutes keep their shape over time, allowing for perfectly rounded baguettes. The Siltray® is coated with multiple layers of high quality red and black silicone. This ensures that the baguette tray lasts longer and creates better results.